These have had a makeover! (15/8/2017) New pictures were added to the post. They are still the same delicious wholemeal dairy free pikelets. But they needed a makeover, because they are seriously awesome and deserve some love! so yummy! Top them how you like. 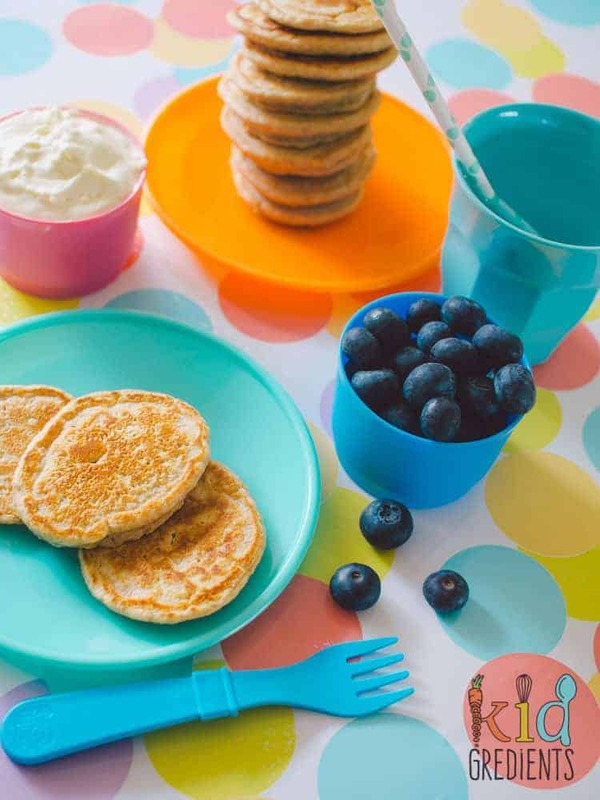 Pikelets are a strangely alluring food for little kids. 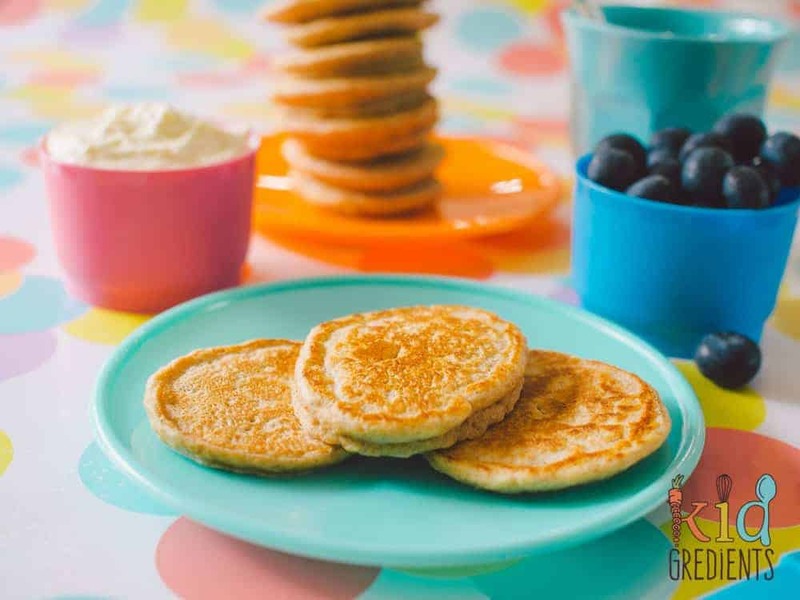 They are like a pancake but slightly more satisfying, just the right size for little hands and yummy without toppings. But they are normally made with plain flour and I wanted to make this special treat a bit healthier. 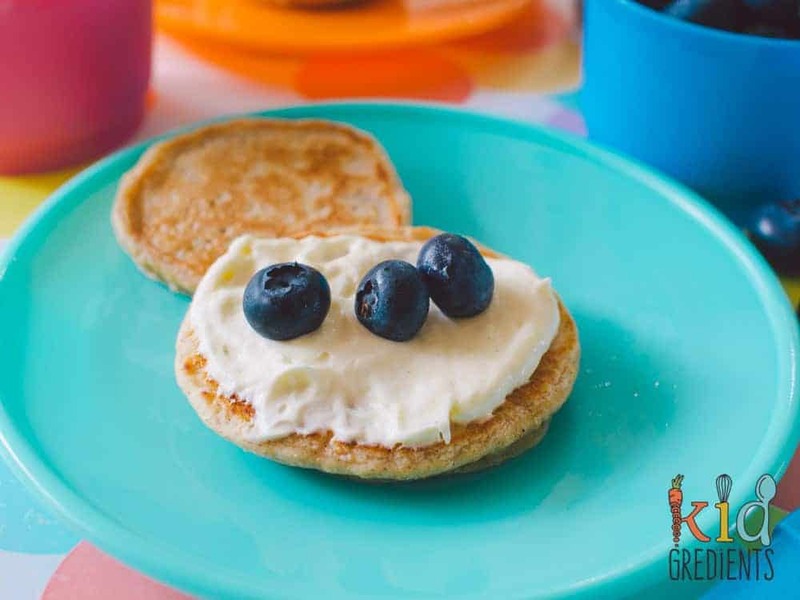 Wholemeal, dairy free pikelets are perfect in the lunchbox too. What will you top them with? 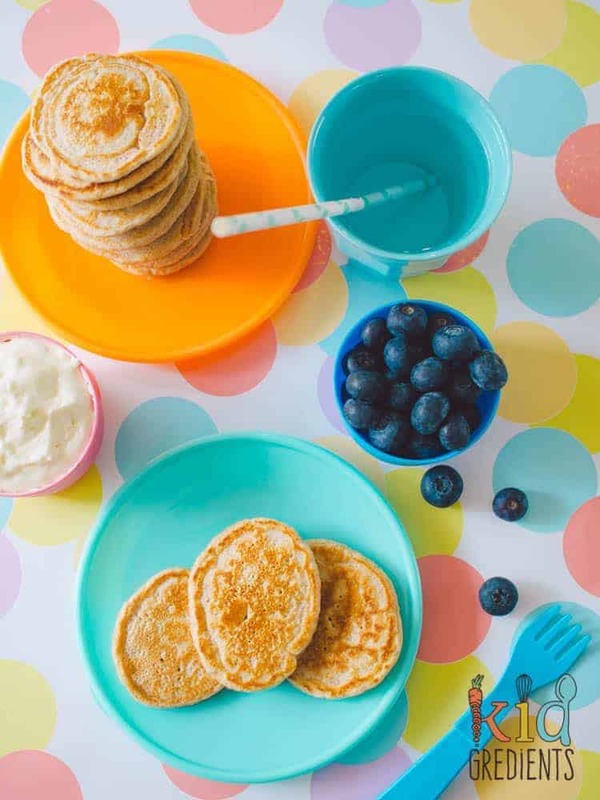 There’s no risk that they won’t eat these healthier alternative to the standard pikelet though, as a pinch of cinnamon ensures they are extra tasty! As I’m typing this we are down to 3 pikelets left. I’ve had one, they keep disappearing from the plate! I was going to tell you that you can pop them in the freezer for other times….but that won’t be happening today! Even yummy on their own! 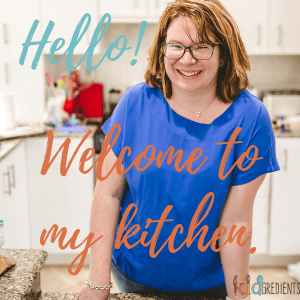 Handy in the freezer, they will defrost overnight in the fridge for lunchbox inclusion, or pop them in the lunchbox in the morning and they will be ready for lunch. if you double batch them you’ll be sure to have some left to freeze. Particularly yummy smeared with coconut butter….nom nom! I’ve topped them with yoghurt mixed with vanilla for the photos and some blueberries for sweetness! With some of these in the freezer you are never short of a lunch snack, a breakfast or even a cheeky dessert. They are super versatile, and can be used however you choose! We sometimes squash berries between two of them to make a sandwich. 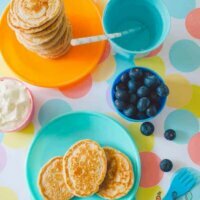 These wholemeal dairy free pikelets are my go to recipe for quick yummy no bake pikelets. 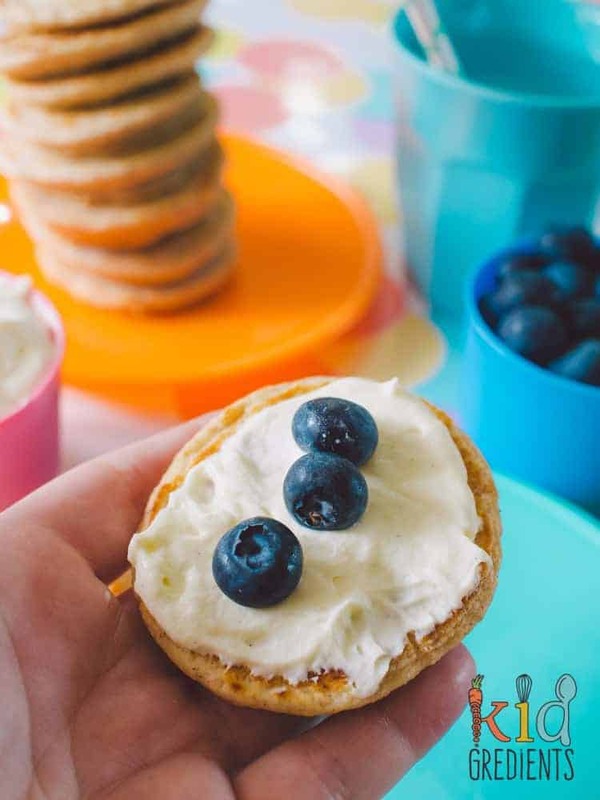 These mini pancakes are low in sugar and perfect topped with yoghurt and berries. Combine all the ingredients in a bowl and whisk until lump free. Heat your fry pan to medium heat and grease it. I used spray coconut oil as it has a yummy flavour, but you could use butter if you like. Add 1.5 tablespoon mounds of the mix to the fry pan. When bubbles rise on the surface then pop, you can turn the pikelets. Cook for about a minute on the other side then remove from the pan.